Patricia Simons, "Women in Frames: The Gaze, the Eye, the Profile in Renaissance Portraiture"
p. 39: Studies of Renaissance art have had difficulty in accomodating contemporary thinking on sexuality and feminism. The period which is presumed to have witnessed the birth of Modern Man and the discovery of the World does not seem to require investigation. Renaissance art is seen as a naturalistic reflection of a newly discovered reality, rather than as a set of framed myths and gender-based constructions. In its stature as high culture, it tends to be either applauded or ignored (by the political right or left respectively) as an untouchable, elite production. 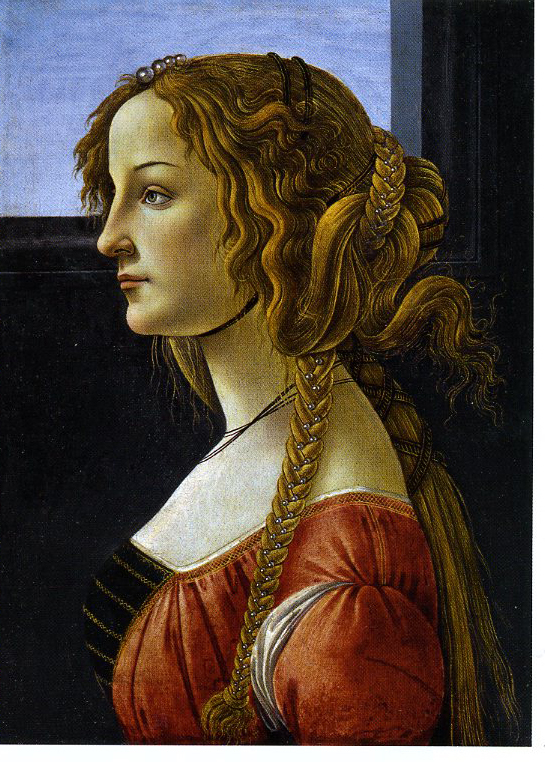 My work on profile portraits of Florentine women attempts to bring theories of the gaze to bear on some of these traditional Master theories, thereby unmasking the apparent inevitability and neutrality of Renaissance art. /p. 40: Usually, the utilization of the profile in fifteenth-century art is explained by recourse to the revival of the classical medal and the importation of conventions for the portrayal of courtly rulers, evoking the celebration of fame and individualism. Such causal reasoning is inappropriate to the parameters and frames of Quattrocento women. In this paper, profile portraits will be viewed as constructions of gender conventions, not as natural, neutral images. Behind this project lies a late-twentieth century interest in the eye and the gaze, largely investigated so far in terms of psychoanalysis and film theory. Further, various streams of literary criticism and theory make us aware of the construction of myths and images, of the degree to which the reader (and the viewer) are active, so that, in ethnographic terms, the eye is a performing agent. Finally, feminism can be brought to bear on a field and a discipline which are only beginning to adjust to a de-Naturalized, post-humanist world. Burckhardt again looms here, for he believed that "women stood on a footing of perfect equality with men" in the Italian Renaissance, since "the educated woman, no less than the man, strove naturally after a characteristic and complete individuality." That the "education given to women in the upper classes, was essentially the same as that given to men" is neither true, we would say, nor adequate proof of their social equality. Joan Kelly's essay of 1977, "Did Women Have a Renaissance?," opened a debate amongst historians of literature, religion and society, but art historians have been slower to enter the discussion. A patriarchal historiography which sees the Renaissance as the Beginning of Modernism continues to dominate art history, and studies of Renaissance painting are little touched by the feminist enterprise. Whilst images of or for women are now beginning to be treated as a category, some of this work perpetuates women's isolation in a separate sphere and takes little account of gender analysis. Instead, we can examine relationships between the sexes and think of gender as "a primary field with which or by means of which power is articulated." So we need to consider the visual /p. 41: construction of sexual difference and how men and women were able to operate as viewers. Further, attention can be paid to the visual specifics of form rather than content or "iconography," so that theory can be related to practice. 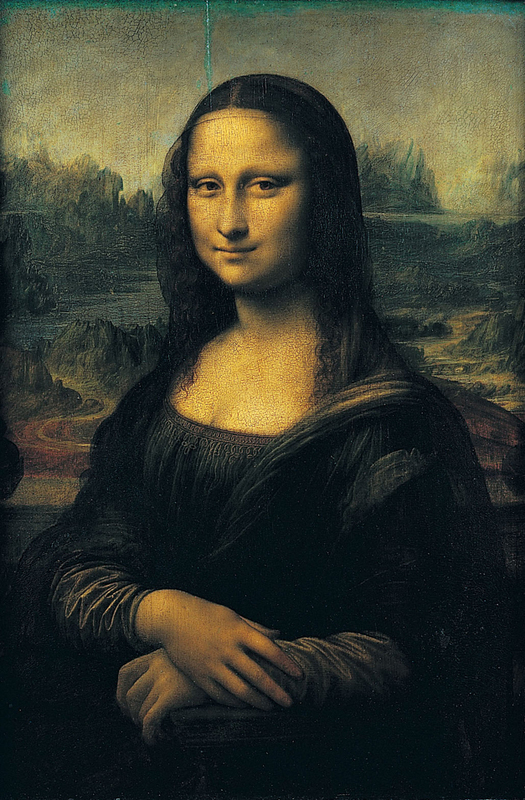 For some time, however, women were still predominantly restricted to the profile, and most examples of this format are dated after mid-century. 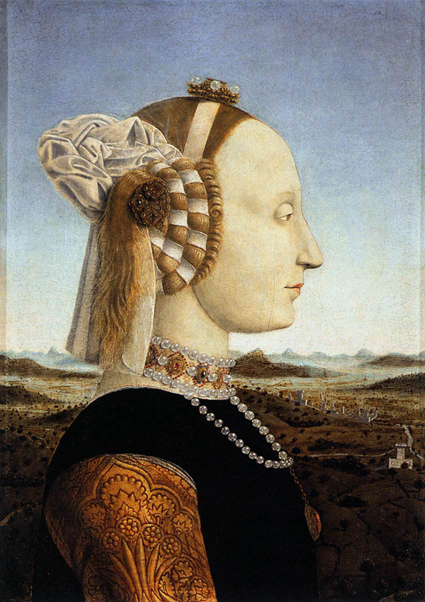 Only in the later 1470's do portraits of women once more follow conventions for the male counterparts, moving out from the restraining control of the profile format, turning towards the viewer and tending to be views of women both older and less ostentatiously dressed than their female predecessors had been. Such a change has not been investigated and cannot be my subject here, which is to highlight the predominance of a female presence in Florentine profile portraits. To be a woman in the world was /is to be the object of the male gaze: to "appear in public" is "to be looked upon," wrote Giovanni Boccaccio. The Dominican nun Clare Gambacorta (d. 1419) wished to avoid such scrutiny and establish a convent "beyond the gaze of men and free from worldly distractions." The gaze, then a metaphor for worldliness and virility, made of Renaissance woman an object of public discourse, / p. 42: exposed to scrutiny and framed by parameters of propriety, display, and "impression management." Put simply, why else paint a woman except as an object of display within male discourse? Only at certain key moments could she be seen, whether at a window or in the "window" of a panel painting, seen and thereby represented. These centered on her rite of passage from one male house to another upon her marriage, usually at an age between fifteen and twenty, to a man as much as fifteen years her senior. Her very existence and definition at this time was a function of her outward appearance. Pleading for extra finery and household linen, rather than merely functional clothing, to be included in her dowry, one widow implored her children, when her brothers forced her into a second marriage, "Give me a way to be dressed." This woman virtually pictures herself as naked and undefined unless a certain level (modo) of (ad)dress or representation as will as wealth can be attained. Costume was what Diane Owen Hughes calles "a metaphorical mode" for social distinction and regulation. The "emblematic significance" of dress made possible the visible marking out of one's parental and marital identity. A bearer of her natal inheritance and an emblem also of her conjugal line once she had entered the latter's boundaries, a woman was an adorned Other who was defined into existence when she entered patriarchal discourse primarily as an object of exchange. Without what Christiane Klapisch-Zuber calls "publicity," the important alliance forged between two households or lineages by a marriage was not adequately established. Without witnesses, the contract was not finalized. By contrast, the priest's presence at this time was not legally necessary. Visual display was an essential component of the ritual, a performance which allowed, indeed expected, a woman's visible presentation in social display and required an appropriately honorable degree of adornment. The age of the women in these profile portraits, along with the lavish presence of jewelry and fine costumes (usually outlawed by sumptuary legislation and rules of morality and decorum), with multiple rings on her fingers when her hands are shown, and hair bound rather than free-flowing, are all visible signs of her newly married (or perhaps sometimes betrothed) state. The woman was a spectacle when she was an object of public display at the time of her marriage but otherwise she was rarely visible, whether on the streets or in monumental works of art. In panels displayed in areas of the palace open to common interchange, she was portrayed as a sign of the ritual's performance, the alliance's formation and its honorable nature. An example of a father's attention to his daughter before marriage, however, also points up attitudes taken to a woman's public appearance. 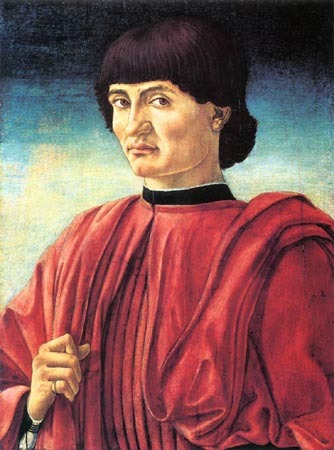 Whilst Giovanni Tournabuoni granted jewelry to his daughter Ludovica as part of her lavish dowry, he will of 1490 nevertheless stipulated that two of the valuable, carefully described items ultimately remain part of his male patrimony, for they were to return to his estate upon her decease. 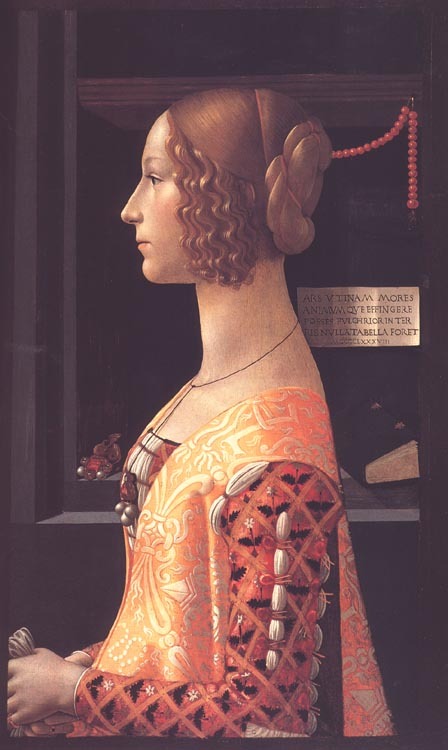 A cross surrounded by pearls, probably the "crocettina" mentioned in Giovanni's will, hangs from Ludovica's neck in her portrait by Domenico Ghirlandaio within the family chapel at Santa Maria Novella, decorated at her father's expense between 1486 and 1490. She also wears a dress richly brocaded with the triangular Tornabuoni emblem. So, at the time when she was betrothed but not yet married, not long before she passed beyond their confines, she is displayed forever as a Tornabuoni woman, wearing their emblem and wealth. 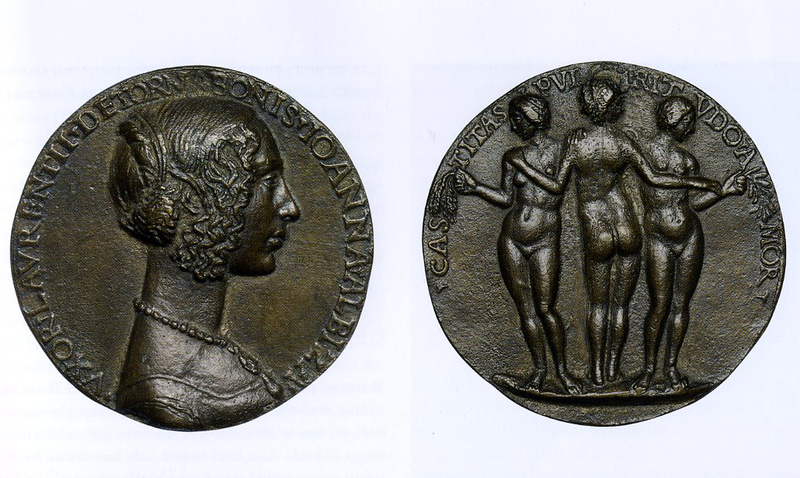 Ludovica is also represented as a virginal Tornabouni exemplar, attendant at the Birth of the Virgin and with her hair still hanging loose, as it had in her earlier medal, where a unicorn on the reverse again emphasized her honorable virginity. In the chapel fresco Ludovica is presented as the perfect bride-to-be, from a noble and substantial family, about to become a child-bearing woman. Her father's solicitude and family pride oversaw the construction of a public image declaring her value and thereby increasing Tornabuoni honor. Soon her husband will conduct her on her rite of passage, collect his dowry and appropriate her honor to the needs of his lineage. /p. 43: When the bride went fuori ('outside') and was "led" or "taken away" by her husband, she bore a counter-dowry of goods supplied by him. 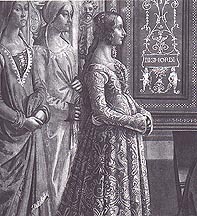 One mother, Alessandra Strozzi, happily reported her daughter in 1447 that "When she goes out of the house, she'll have more than 400 florins on her back" because the groom Marco Parenti "is never satisfied having things made for her, for she is beautiful and he wants her to look at her best...."
In wanting his bride "to look at her best" Marco was seeking a visible, displayable sign of his honor. Indeed a wife's costume was considered by jurists a sign of her husband's rank. "Being beautiful and belonging to Filippo Strozzi," Alessandra wrote to her son of a potential bride in 1465, " she must have beautiful jewels, for just as you have won honor in many things, you can not fall short in this." Like the "golden facade" of a palace, "such adornments...are taken as evidence of the wealth of the husband more than as a desire to impress wanton eyes," wrote Francesco Barbaro in his treatise On Wifely Duties of 1416. To Barbaro, a wife's public appearance was a sign of her propriety and her husband's trust: wives "should not be shut up in their bedrooms as in a prison but should be permitted to go out [in apertum], and this privilege should be taken as evidence of their virtue and probity." 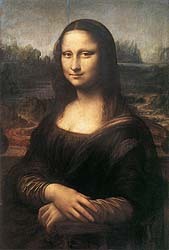 He then went on, "By maintaining a decorous and honest gaze in their eyes, the most acute of senses, they can communicate as in painting, which is called silent poetry...." Attributes of costume, jewelry and honorable bearing are as much signs as the occasional coats of arms in these portraits. And in Florence, these heraldic devices are the husband's, for the woman has been renamed and inscribed into a new lineage. 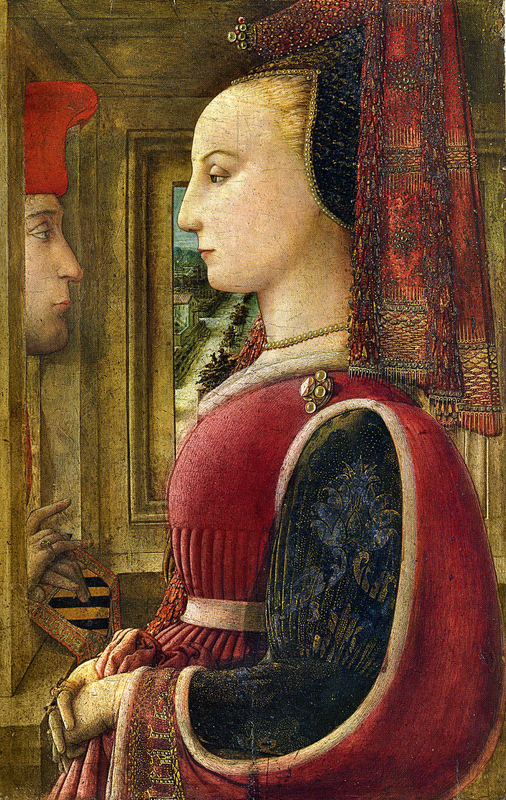 Hence in Filippo Lippi's Portrait of a Man and Woman at a Casement, the Scolari man's coat of arms is matched not by her own natal heraldry but by her motto, embroidered in his pearls on the sleeve she has been given, which avows "Loyalty" to him. Perhaps we can find an explanation for those numerous donor portraits in profile by considering the...linkage, by the nun Clare Gambacorta, between "the gaze of men" and "worldly distractions." Particularly when shown in profile, the donor's faces are visible to both divine and "worldly," sacred and "secular" (yet sacralized) realms, seen by the adored sanctities yet also viewed by priests and devotees, including the donors themselves. Like nuns and donors /p. 44: the women portrayed in profile are displayed and visible objects, and yet they are removed from "worldly distractions." They are inactive objects gazing elsewhere, decorously averting their eyes. In this sense they are chaste, if not virginal, framed if not (quite) cloistered. However, unlike nuns, these idealized women are very much not "beyond the gaze of men." Visually, the strict orderliness of the profile portrait can be seen as a surprising contradiction of contemporary misogynist literature. Supposedly "inconstant," like "irrational animals" without "any set proportion," living "without order or measure," women are transformed by their "beauty of mind" and "dowry of virtue" into ordered, constant, geometrically proportioned and unchangeable images, bearers of an inheritance which would be "precious" to their children. A woman, who was supposedly vain and narcissistic, was nevertheless made an object in a framed "mirror" when a man's worldly wealth and her ideal dowry, rather than her "true" or "real" nature, was on display. 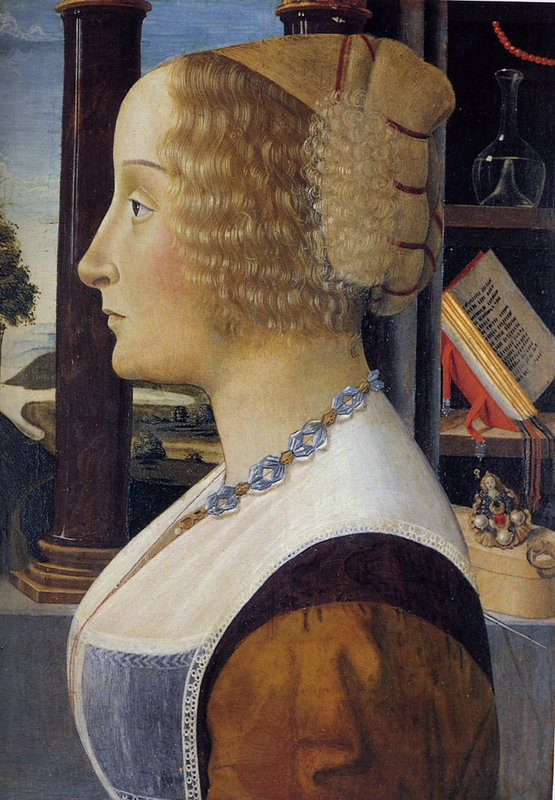 Giovanna Tornabouni's portrait by Domenico Ghirlandaio contains an inscription, with the date 1488, indicating that "conduct and soul" were valuable, laudable commodities carried by the woman. Further, depiction strove for the problematic representation of these invisible virtues" "O art, if thou were able to depict the conduct /p. 45: and soul, no lovelier painting would exist on earth." 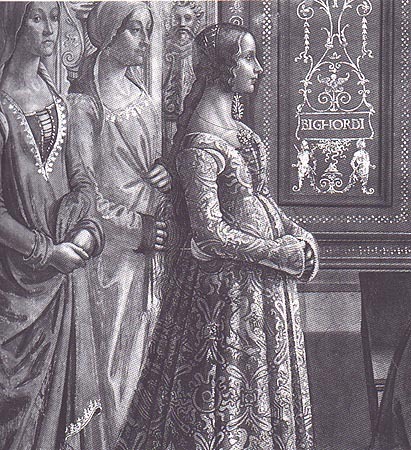 Having died whilst pregnant in 1488, the new dead Giovanna née Albizzi is here immortalized as noble and pious, bearing her husband's initial, L for Ludovico, on her shoulder and his family's simplified, triangular emblem on her garment. She is forever absorbed as part of the Tornabuoni heritage, displayed in their palace to be seen by their visitors and themselves, including her son, who bore their name. Within the panel, she is framed by a simple, closed-off room; within the palace, we know from an inventory, she was actually framed in a "cornice made of gold" on show in a splendid "room of golden stalls." Sealed in a niche like her accourtrements of piety and propriety, she is an eternally static spectacle held decorously firm by her arm, neck, and spine. Giovanna's very body becomes a sign, attempting to articulate her intangible but valuable "conduct and soul." The "dowry of virtue" is encased and contained within her husband's finery, each enhancing the other. Forever framed in a state of idealized preservation, she is constructed as a female exemplar for Tornabuoni viewers and others they wished to impress with this ornamento. A woman's painted presence shares with cultural values of the time an idealized stock of impressive, manipulative language available within Quattrocento culture. Visual art, it can be argued, both shared and shaped social language and need not be seen as a passive reflection of predetermining reality. For the representation of women, the profile form and its particulars were well suited to the construction, rather than reflection, of an invisible "reality." 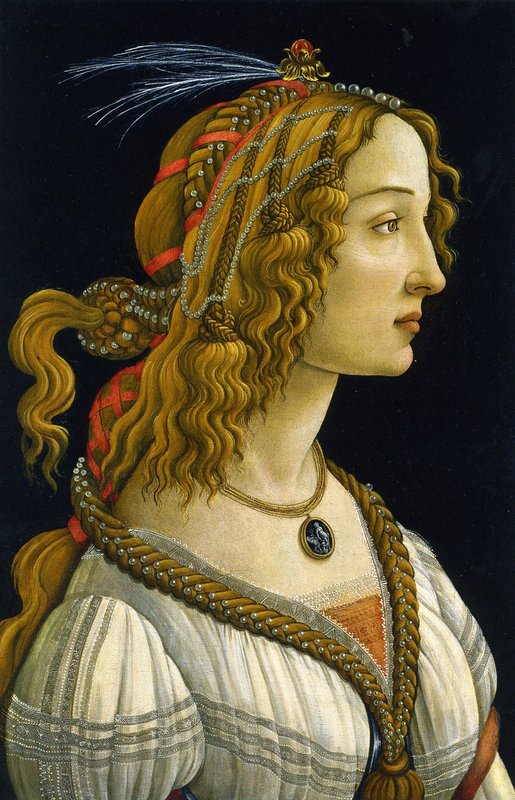 Giovanna was born in 1468, the daughter of Maso degli Albizzi. 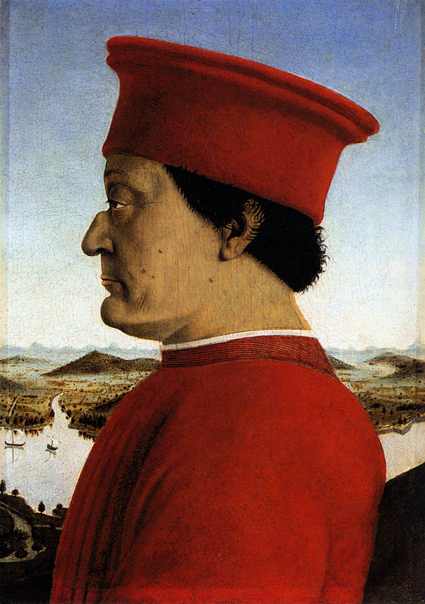 Lorenzo Medici arranged the marriage of Giovanna to Lorenzo Tornabuoni, son of Giovanni. 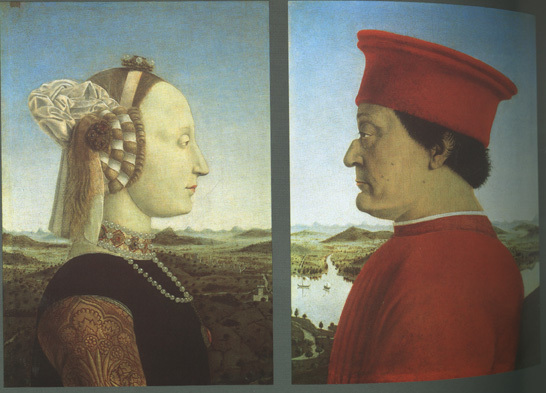 The marriage celebrated on June 15, 1486 marked the alliance of two major Florentine families. 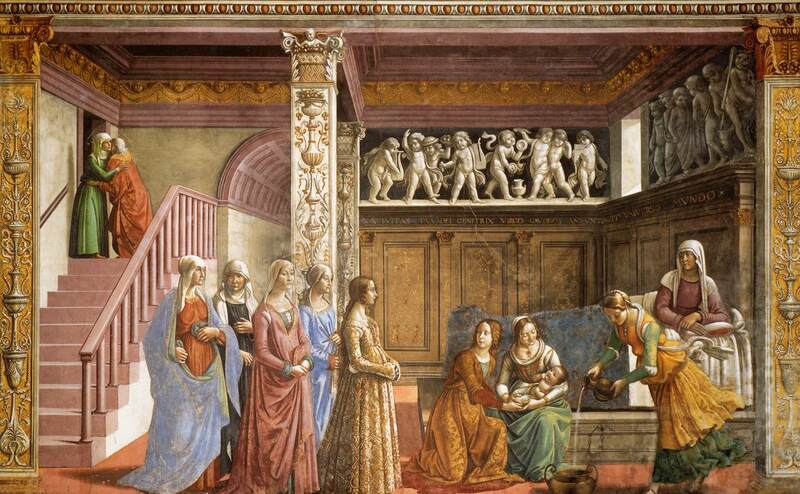 In October of 1487, Giovanna gave birth to a son, Giovanni, thus fulfilling her dynastic role. She died in child birth in October of 1488. /p. 50: In fifteenth-century society, lowered or averted eyes were the sign of a woman's modesty, chastity and obeisance. A loose woman, on the other hand, looked at men in the street. Temptation or a lover were avoided or discouraged if a virtuous woman did not return the gaze. attributed to Domenico Ghirlandaio, Portrait of a Young Man and Young Woman, c. 1490. The physiogomy and details of the hair of the Venus figure have striking similarities to the woman in the Frankfurt portrait. The wasps that buzz around the head of Mars in the London panel suggests an association with the Vespucci family which had on its coat of arms wasps (Vespucci in Italian means "little wasps). Simonetta Cattaneo, born in Genoa, married Marco Vespucci in 1468. She died at the age of 23 in April of 1476.